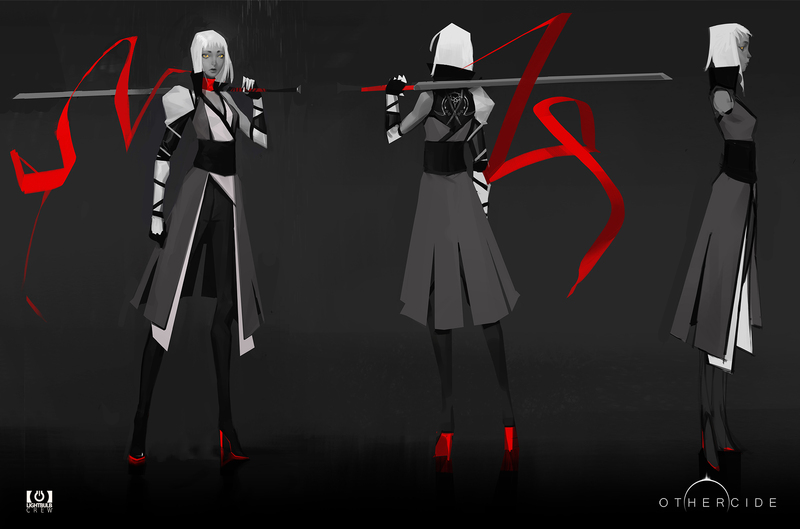 There are three distinct archetypes within the Daughters of Othercide, each one of them with their own strengths and weaknesses. Nizar and Alexandre, Game Designer and Art Director on the project, write about the birth of the Blademaster. From its prototyping to its design, let's take a better look at our monster slayer. Nizar: As Game Designers, we were at the origin of the Blademaster conception. Early in the development process, it appeared to be clear that we wanted a triumvirat of Daughters. To increase players’ strategic decision making, each daughter must have unique strengths and weaknesses: we didn’t want to create subtle variation of a single archetype. Alex: Creating a class in Othercide is a crucial step: in addition of being the main characters of our players, each class must represent a clear function gameplay wise as well as follow the guidelines of our art direction. Building our classes was a long ongoing process, with a lot of iterations and questioning! In my point of view – and this is applicable in multiple situations – a character rises from a couple of strong ideas. Those main “impulsions” don’t need to be very original, but must be clear and definitive so that they can resonate along the creative process. Nizar: We wanted the Blademaster to be a strong melee opponent specialized in one versus one encounter. 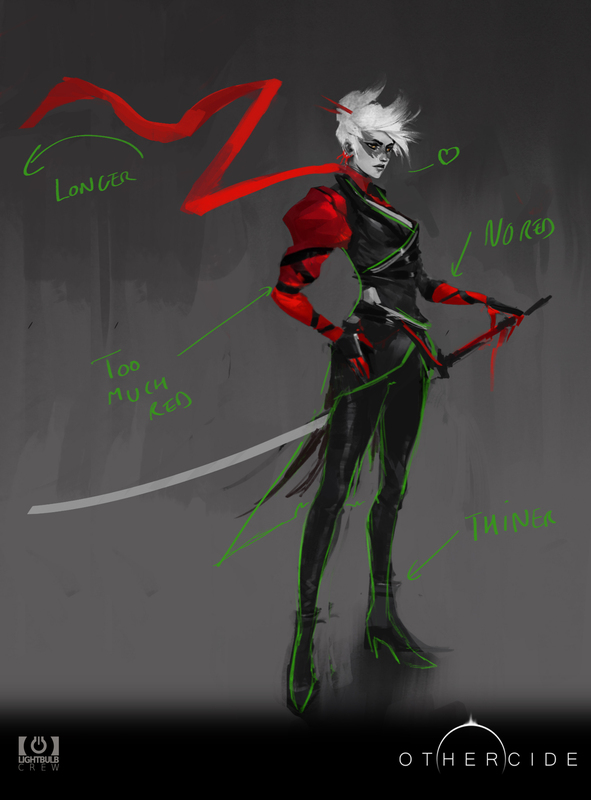 Before we started to work on her skills or statistics, we first made a “moodboard” for the art team, and we introduced our global intention for this character to the rest of the team. Alex: On our side, we quickly understood what kind of intentions were intended for this Daughter, and it holds in one sentence: “she is a powerful, agile, traditional sword fighter”. We needed our Blademaster to be quick and swift, an honorable and proud disciplined warrior who will silently (but brutally!) slaughter any nightmare creature emerging from the Dark Corner. Nizar: Once the first white box prototype established, we started to play with the Blademaster’s statistics. Each character in Othercide is defined by « 13 variables » but the three that mostly define the Blademaster are her high Damage output, low Armour and high Dodge. The Damage variable is exactly what it sounds like, she can do more damage per turn than any other class. We wanted to avoid giving her a way to sustain multiple attacks from enemies, so we drastically reduced her Armour rate (« Armour » is a straight damage reduction at each hit). 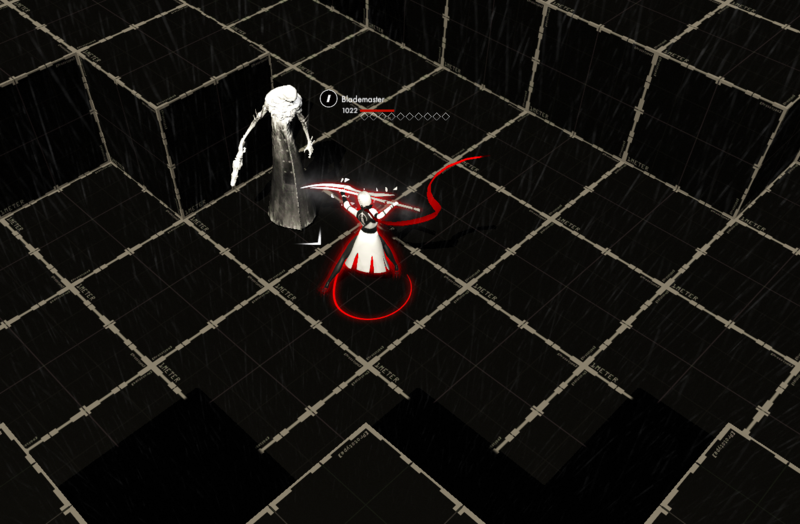 The way we handle Dodge in Othercide is a little different from what player are used to tackle with. Every attack sustained reduces the Dodge of the target, even if the attack misses, and this variable regenerates only during the active turn of the Daughter. With a lot of dodge, the Blademaster has a good chance to totally fudge an attack but this chance is quickly reduced to 0, especially if multiple enemies attack before her turn, negating this advantage. During pre-production we tested several skills with the Blademaster, each one of them being hardcoded by our development team. This was a great way to test our intentions, but this took a lot of time. For each modification we wanted, we needed to work hand in hand with a developer – and they were (and still are) already quite busy! For production, we created a tool that game designers can use easily which allows us to craft skills on our own, and drastically reduce the time between each playtest. The variables defined in pre-production are not set in stone. Since then, we made some complex excel sheets to give a mathematical basis to our assumption. This was useful when we needed to define how statistics evolved when a daughter reaches a new experience level. 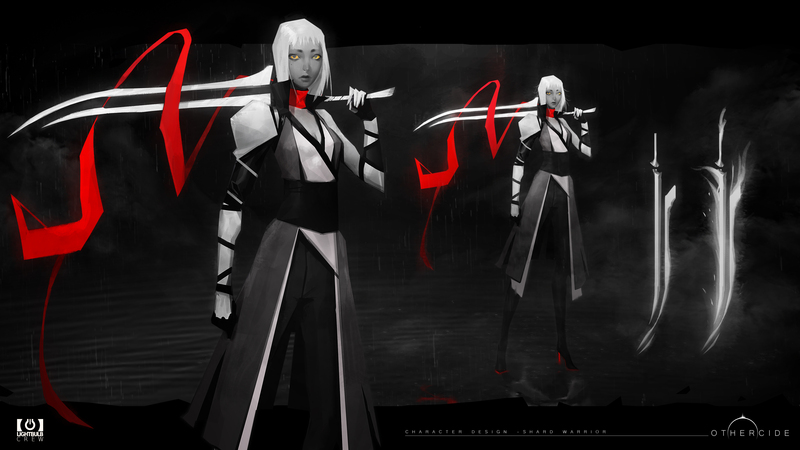 Alex: Othercide uses a stylized art direction, especially on our characters. It gives us the freedom to “enhance” our intentions, nail down each point we want to express artistically. Even though we had to follow some unbreakable rules in the art direction (all Daughters wear a red scarves, must remain in black and white…). Therefore, our first Blademasters had a very strong “Asian martial art” vibe, a kind of modern “haute couture” version of a samurai/ninja. Despite the great work of our concept artists, I wasn’t fully satisfied ; I felt we needed a deeper step in synthesizing, finding a pure essence of our ideas. I wanted to avoid the cliché of “just” being a parodic version of any ninja… So I pushed the stylization a step further, not a radical change but just enough. What would be a sword-fighter without a mighty blade? We knew each class would be defined by the weapon they handle, and it is even more obvious with the Blademaster… her sword is an extension of her soul, a brother in arms against the dark legions of the Others. Once again, we didn’t want to stay in the common boundaries of an “Asian katana”, and I wanted to increase the sensation of “great power” from our initial intensions. – Ok, ok, I must confess I really like huge swords too… ! Since Othercide doesn’t have an equipment system (there are no “sword+54” or “legendary helmet” to collect… but still some other stuff to discover! ), we knew that each weapon would have to be considered as a character itself. That’s how we built our “shattered weapons”, a deconstructed and ethereal arsenal. The Blademaster’s sword is all in curves and pure shapes and completes our lethal and dexterous character. Nizar: It was a lot of fun to see the Blademaster evolve from a simple idea in our head and through our early pen and paper prototypes months ago, to the deadly assassin we can see now in artworks and 3D ingame! Designing a pure melee character for a tactical game – a genre where we are mostly used to long distance encounters and cover systems ! – was challenging for sure, but we’re all proud of the result. I can’t wait to see what unexpected tactics players will try with her! Alex: Don’t worry Nizar, we created a bunch of horrible creatures to keep your Blademaster busy! Let’s unleash the nightmares from the Dark Corner, my friends! Bringing the Blademaster to life in 3D has been a very fun (but not easy!) task. The first step was to sculpt in ZBrush the base body and face that would be used for the Daughters. When this foundation was validated, I sculpted the clothes for each class. Since we are working on a tactical turn-based game, I focused on having clean stylized shapes that are easy to read especially from a top down camera view. The Daughters needed to feel pure and contrast with the more detailed vicious creatures. Each detail – like folds and cloth layers – had to be relevant. I constantly had the proverb “less is more” in mind while sculpting the Blademaster clothes. Another parameter to consider was the end product: an animated low-poly mesh. So I had to visualize how would behave certain parts when animated, in order to adapt and allow for good deformation. On this matter, the Blademaster’s waist area was the most tricky due to the layering of the shirt, kimono, belt and pants. The texturing process on the baked low-poly model went pretty smoothly, the main challenge being bringing some details and variations in the different areas with subtle gradients and handpainting. While the character was already designed, I still had some space for my own interpretation and creativity. The hair was modeled in Maya, the blade and scarf were made by fellow artists Chris (3D Character Artist) & Nico (Tech Artist).